The Column Statistics page displays statistics for a grade item, including average, median, and standard deviation. You can also view how many need grading and how the grades are distributed. From your course Control Panel open the Grade Centre. 2. Find the column about which you are interested in producing statistics and click on the action button beside the column heading. 3. Choose Column Statistics from the menu that appears. 4. The statistics will be shown. Information available to University Staff about student usage of Blackboard. Blackboard is provided as a Virtual Learning Environment to support teaching and learning at the University of Southampton. To assist University Staff in assessing academic progress, Blackboard provides a number of tools described below, which provide information about student use of Blackboard courses. This feature is available in every Blackboard course and does not need to be enabled. Statistics are kept for the duration of the course (usually 1 year). On courses with large cohorts the volume of data is so large that it is necessary to examine small amounts at a time, for example one month’s worth of data. 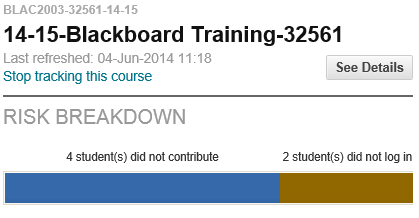 This feature allows the instructor to enable tracking of a single piece of content in a Blackboard course. This must be turned on for the single item before it can be used. Tracking of accesses made to that content takes place from the moment the feature is enabled. The Performance Dashboard provides an “at a glance” view of student usage of a course. The dashboard shows the students enrolled on a course, when they last logged into Blackboard, how many documents students have marked as reviewed (for documents with “review status” enabled), what is visible to students through adaptive release, and provides a link into the gradebook to view student grades. This feature does not need to be enabled. The lastname, firstname, iSolutions username, and course role are shown. This displays the last time the student accessed the course. This displays the number of days since the student last accessed the course. This shows the number of documents viewed by the student for which review status has been enabled. This opens the Course Map, showing every possible item in the course. Icons beside each item in the Course Map indicate the visibility of an item to that course user, and the review status of any items with a review requirement, if applicable. The number of posts made by the student to any discussion forums. This shows for how many rules the student matches the rule criteria. Provides links to the Gradebook: User Grade List page for that user. 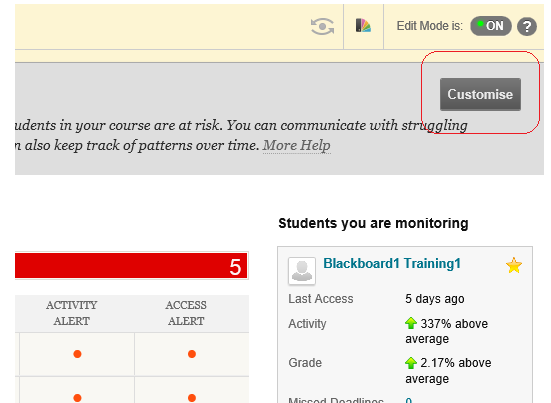 The Early Warning System is a feature in Blackboard that allows course University Staff to check on student progress within their course according to certain criteria. This feature uses two processes. First the instructor creates a rule based on criteria such as a Grade Centre score and last access to the course. Once this has been created the instructor may run it so that it finds any students that match the criteria. Using this information the instructor may send a notification to students who meet the criteria via an email. A grade rule can be used to identify when student performance as recorded in a Grade Centre column meets certain criteria. A due date rule may be used to identify students who have not completed a Blackboard facilitated Test, Survey or Assignment by the Due Date. A last access rule can be used to identify students who have not accessed a course for a certain number of days. University staff may use Blackboard information from the above features and authentication log files as an information source for the Student Retention Project and Tier 4 attendance monitoring. It is possible to track how students are using your Blackboard course. 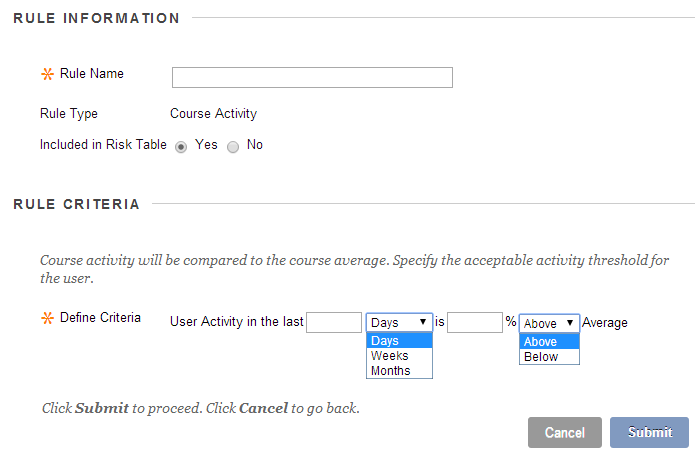 Individual items can be tracked when this option has been enabled, and course wide statistics are also available. A number of other features provide insights into student performance on your Blackboard course. Note that in order to preserve system performance reporting data is only available for 180 days worth of usage. Use the guides below to find out more. Use this guide to find out how to track usage of individual items of content you have added to your Blackboard course that have tracking enabled. Use this guide to find out how to access course wide statistics covering usage of your course as a whole. 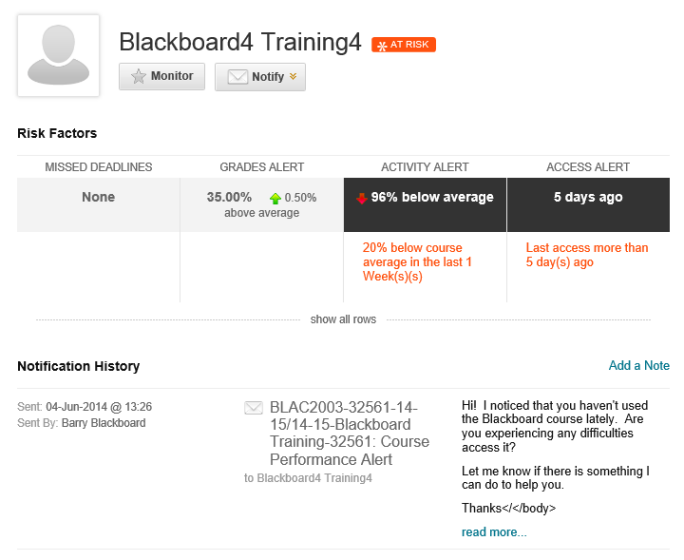 The performance dashboard provides an at-a-glance view of student progress through your Blackboard course. Blackboard’s Retention Centre alerts you to students who meet rules that may indicate their educational experience is at risk on each of your courses. Each course is set up with some predetermined rules and you may add your own. The Blackboard Grade Centre provides an area within your Blackboard course to store results data. Student scores from Blackboard tests and surveys are stored in the grade centre automatically. You may also manually add scores and information that are not automatically added by Blackboard. The Performance Dashboard provides an “at a glance” view of student usage of your course. The dashboard shows the students enrolled on your course, when they last logged into Blackboard, how documents they have marked as reviewed (for documents with “review status” enabled), what is visible to them through adaptive release, and provides a link into the gradebook to view student grades. 1. From your course’s Control Panel, expand the Evaluation section and click on Performance Dashboard. This shows to for how many rules the student matches the rule criteria. An easily printable page is created by clicking on the Print icon. 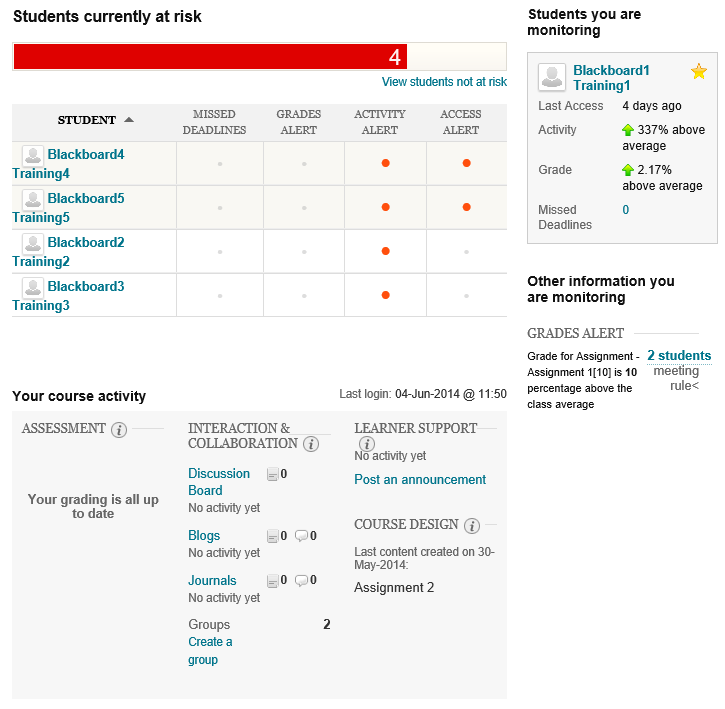 Risk alerts are highlighted in Blackboard Global Navigation, alerting the instructor immediately to students that may be at risk. This guide explains how to access and view the retention centre. Please note that language used in this feature is the choice of the vendor and not of the University of Southampton. 1. 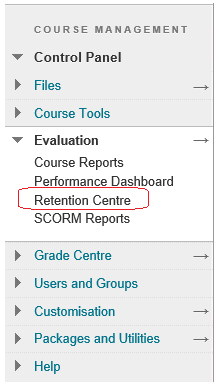 The quickest way to get an overview of the retention centre is to open the Global Navigation menu and click on the retention centre icon which looks like a pair of upward and downwardly pointing arrows. The number beside this icon refers to the number of risk rules that are currently matched. 2. Viewing the Retention Centre Summary within the Global Navigation you can identify which risk rules are being met and by how many students for each course. 3. Click on See more details to find out more about each rule. 4. Click on Stop tracking this course if you no longer wish to be alerted about a certain course. 5. The next slides explain the details you will see when you click for more details. Another way to access the Retention Centre for a specific course is to expand the Evaluation part of your Course’s Control Panel and click on Retention Centre. 6. We see the full retention centre screen which focuses on the “Risk Table”. The next slides break down each aspect of this screen. 7. The risk table shows which students are meeting which risk rules. You can view the opposite by clicking on View Students not at risk. Missed Deadlines: The default rule is to show students who have missed 1 or more deadlines by more than 0 days. Deadlines are set using Due Dates and only apply to Blackboard features that allow you to set Due Dates. This does not include TurnItIn Assignments. Grade Alert: The default rule is to show students who have an External Grade column (usually the running total) within the Grade Centre that is 25% below the average for the class. Activity Alert: The default rule is to show any students who have access the course at a rate 20% below the average of all students on the course in the past week. The data for the course activity rule is recorded once a day. Access Alert: The default rule is to show any students who have not accessed this course at all in the past five days. All of these rules can be adjusted and new rules created. This is discussed in the related guide “How to customise the Retention Centre”. 9. Clicking on the name of a student shows more detail about their alerts. 10. You can choose to monitor a student specifically by clicking on Monitor. Their details will then be shown on the main Retention Centre dashboard under the heading “students you are monitoring”. 11. You may choose to send an email to the student by clicking on Notify. A log of notifications you have sent to the student using this screen will appear below. 12. You can add your own private notes by clicking on Add a Note. 13. Looking again at the main Retention Centre dashboard the section Students you are monitoring will show any students you have chosen to monitor, as shown on the previous slide where you click on the Monitor button to monitor a particular student. 14. The “Other information you are monitoring” heading shows any rules that you have created but chosen not to have included in the “Risk Table”. Creating such rules is covered in the related guide “How to customise the Retention Centre”. This information is only shown to the instructor themselves and is not available in this format to other staff. Whether there are any assessments to mark. Your interactions with any discussion boards, blogs, and journals. 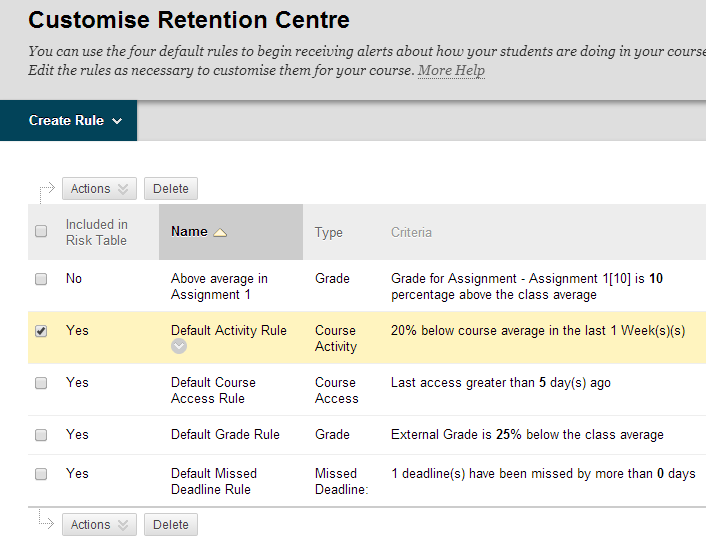 The retention centre in Blackboard contains a number of preset rules. This guide shows how to adjust those rules and set up new ones. 1. To enter the Retention Centre access the Blackboard course concerned and expand the Evaluation part of the Control Panel and choose Retention Centre. 2. Click on the Customise button. This appears at the top right of the Retention Centre screen. 3. The Customise Retention Centre screen is shown. Here follows a break down of the interface. Click on this button to create a new rule. Yes: this rule is included in the risk table shown on the main Retention Centre screen. 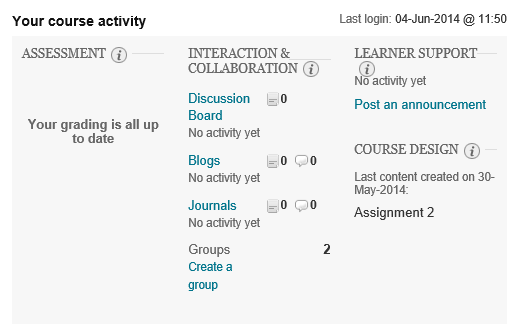 In this screen there will always be four columns, one for each of the rule types, i.e Grade, Course Activity, Course Access, and Missed Deadline. If there is than one rule for one of the above types included in the risk table then student who matches any of those rules will have an entry under that column. No: this rule will not be part of the risk table and instead will appear within the Other information you are monitoring section. The Name of the rule. When you hover your mouse pointer over the name an action button appears. Clicking on this action button will bring up a menu allowing you to edit the existing rule. Information about the criteria used to determine whether a student is affected by the rule or not. Actions: Here you may choose quickly to exclude or include a rule from the rule table by ticking the box beside the rule concerned then clicking on the Action button. Delete: This will completely remove the rule. Even if all rules of a certain type are deleted e.g. 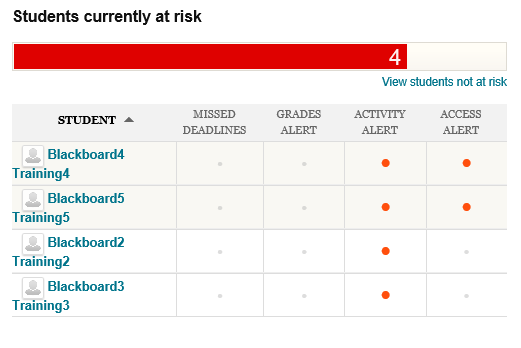 Grade, Course Activity, Course Access, and Missed Deadline, all four columns will continue to be shown in the Risk Table on the main Retention Centre screen. 4. Next we will look at editing an existing rule. To edit an existing rule hover your mouse over the rule name and click on the Action button. Then click on Edit from the menu that appears. 5. Each rule type will have a slightly different set of option but the above screen shot shows how simple it is to use this feature. 6. Next we look at creating a new rule. 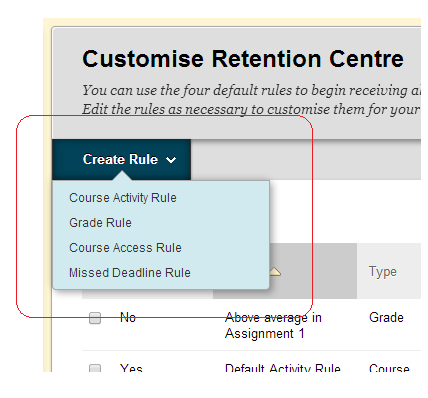 To create a new rule hover your mouse over the Create Rule button on the Customise Retention Centre screen and choose which type of rule you wish to create. The next set of slides cover how to create each rule type. 7. Course activity alerts are based on students’ overall activity within your course. Students who are below a defined level of activity trigger the alert. Blackboard measures the time a student works in a course using the data generated from his “clicks.” A student is assumed to be working with a course from the time he clicks on something in the course until the time he clicks something outside the course or logs out. 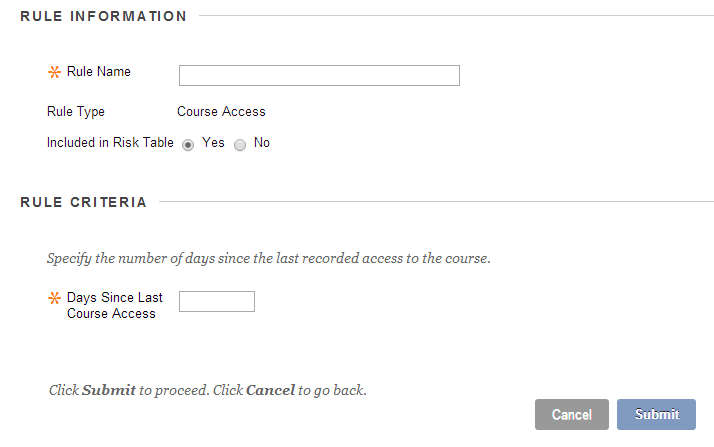 If a login session is timed out, Blackboard only counts the time until the last click within the course. The time is not counted between the last click within the course and the timeout. No weighting of clicks is assigned to any areas. Adaptive rules are not taken into account. 8. Set the criteria according to your preference. 9. 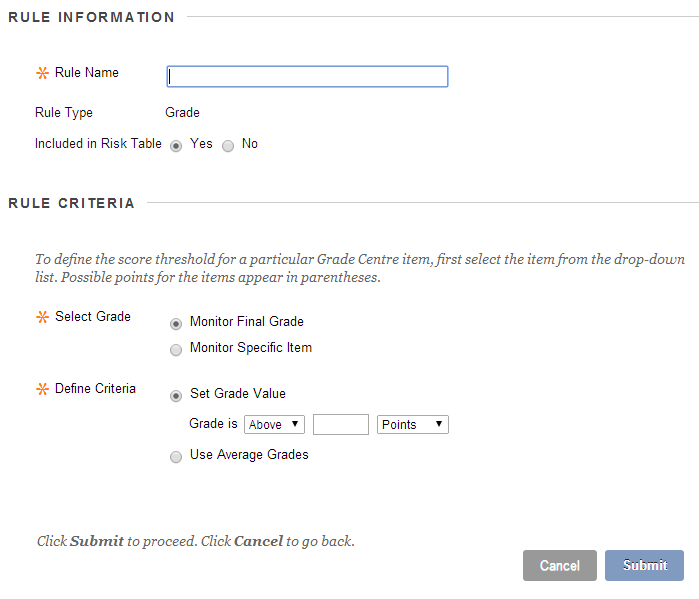 Grade Alerts are based on a defined score for any grade or calculated column in the Grade Centre. 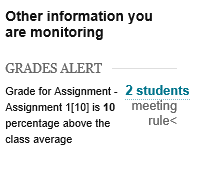 Students who score above or below the defined threshold for a specific grade item trigger an alert. Use the drop-down lists to select above or below -AND- points or percentage. Type a value in the field. Type the percentage in the field and select above or below the average grade from the drop-down list. 11. 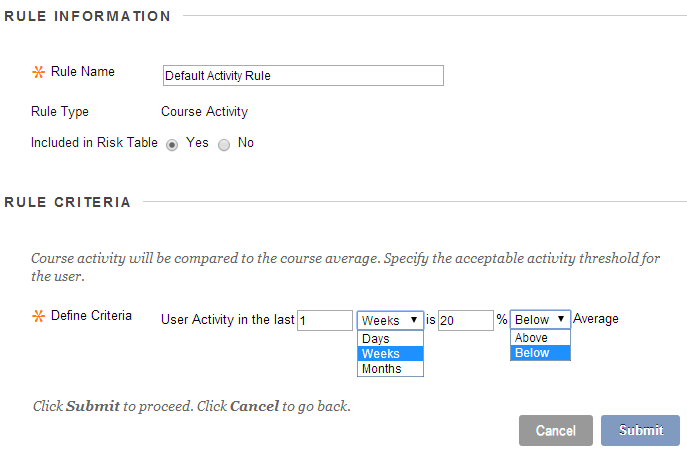 Course access rules can be used to set up alerts based on the date users last accessed your course. Students who have not logged in for a defined number of days trigger an alert. Monitor all course deadlines: Determine how many deadlines must be missed and by how many days before an alert is triggered. From the drop-down list, select More Than or Less Than the number of days you chose. 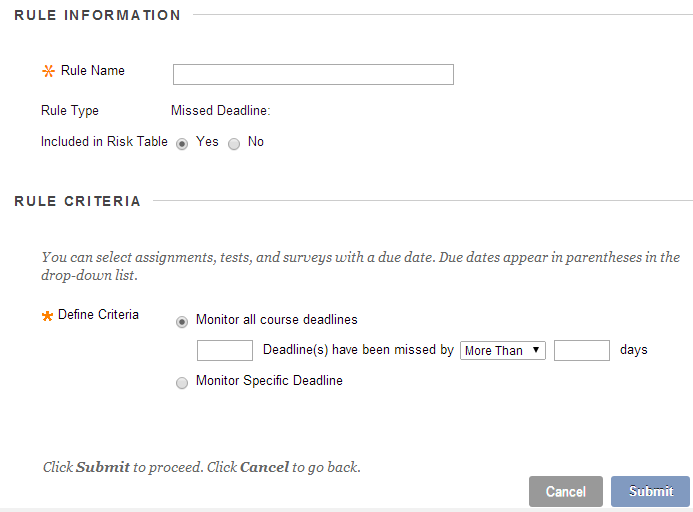 Monitor Specific Deadline: Make a selection in the Select Course Item drop-down list. The due date for each item appears in parentheses. Then, select More Than or Less Than from the drop-down list and type the number of days to trigger an alert. If you enter zero (0) for how many days, you are asking to be alerted if an item was not submitted before or on the deadline. No lateness is acceptable. 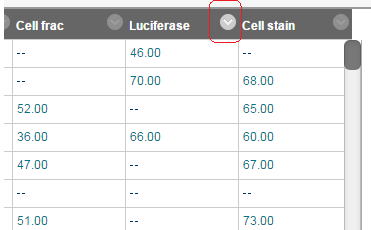 You can create missed deadline rules for Grade Center columns you create manually, but if you do not mark properly submitted items by the due date, a “false” alert is triggered. For manually created columns, students can submit items by the due date, but you must also grade them by the due date. In or Out of the Rule Table? 13. Remember that if you choose to include rules in the risk table then they will be covered within the risk table shown on the main Retention Centre screen. In this screen there will always be four columns, one for each of the rule types, i.e Grade, Course Activity, Course Access, and Missed Deadline. If there is than one rule for one of the above types included in the risk table then student who matches any of those rules will have an entry under that column. If the rule is not included in the risk table then it will appear within the Other information you are monitoring section. It is possible to track the access of an individual item such as a document in Course Documents or Course Information. To do this it is necessary to select, Track Number of Views when you originally added the item. Tracking information is only collected from the time you answered Yes to this question. If your course has more than 1000 student enrolled, limit your reporting criteria to less than 1000 users. Item tracking will only tell you if the item has been shown to a student. So if you have an item in a content area it will tell you how many times the student has gone into the content area and therefore “seen” the item. It does not record how many times any file attachments to the item have been downloaded and opened. It will not tell you that a student has read the content of the item nor any attachments. Note that in order to preserve system performance reporting data is only available for 180 days worth of usage. 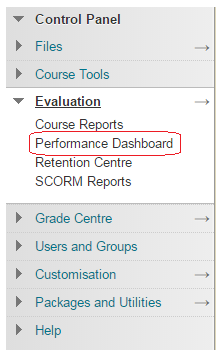 In general we find that using the Performance Dashboard to see how recently students have logged into your course, and course wide statistics are better methods of assessing usage of your Blackboard course. A better way to confirm that students have read a piece of content is to use review status. This allows students to declare that they have reviewed content, and you can review who has made this confirmation. 1. Find the content item in your course for which tracking information is required. 2. Click on the Modify button beside it. 3. 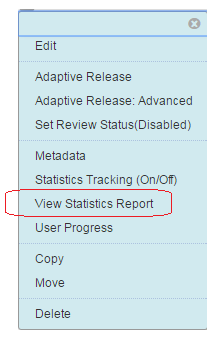 From the menu that appears choose View Statistics Report. 4. You should see report available named Content Usage Statistics. Click on the Modify button beside it. 6. Select the format of the report you prefer, the default is PDF. 7. Select the date range for the report. If your course has a large number of students you may need to run the report in smaller chunks and collate the totals afterwards. Large cohorts can mean that statistics reports time out before they have finished generating. 8. Select the Users about whom you wish to report. Select multiple users by holding down the CTRL key. 9. Click on Submit to run the Report. 10. Click on Download Report. Using the Grade Centre Reports feature you may create customisable reports. Reports may be defined to include groups of students, or selected students, scores from a certain grading period, certain columns, or certain categories. It is also possible to customise the information shown at the beginning and end of the report. 1. Enter your course’s Grade Centre. 2. Hover your mouse pointer over the Reports button and click on Create Report. 3. Select what information should appear in the header. Select the required fields by clicking them. Enter text in the text boxes according to your preference. 4. Select for which users the report should be generated. 5. Choose what information about each user should be shown within the report. 6. Choose which grade information should be shown in the report. 7. Choose which pieces of information about each of the selected columns should be displayed. 8. Select what information should appear in the footer. Select the required fields by clicking them. Enter text in the text boxes according to your preference. 9. Click on Submit to finish. Your report will be shown, click on Print to print it. If you wish to save the report click on the File menu and then Save As… to save the report output to your computer. Use this guide to find out how to access the Retention Centre and understand the information that it presents to you. Use this guide to find out how to customise the default rules within the Retention Centre and create new rules according to your preference. 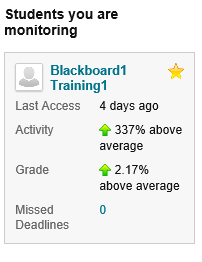 Blackboard allows you to access information detailing student usage of your blackboard course as a whole. Note that if your course has more than 1000 students enrolled you should limit your reporting criteria to less than 1000 students at a time. 1. 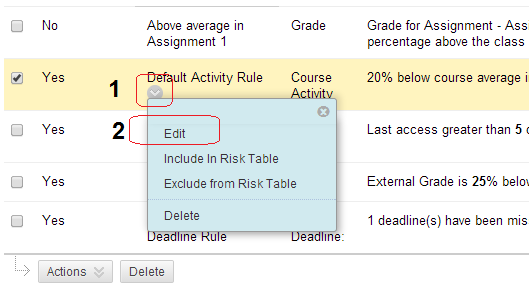 From your course’s Control Panel, expand the Evaluation section and click on Course Reports. 2. Click on the action button beside the report you want and click on Run. 3. Select the format that you would like the report to appear in. 4. Select a start date. 5. Select an end date. 6. Select the users about whom you wish to report. Use the CTRL key to select multiple users. 7. Click on Submit to run the report. 8. The report will be opened. If you experience difficulties right click on the download link and download the file to your computer first.